This is a slow release organic nitrogen source (12 -14%) Ground poultry feather. Use on corn, leafy greens, trees, shrubs, and many other vegetables. Apply at 200-400 lb/acre or for gardens use 25-50 lb/1000 sq ft. Product Code: Fertrell Feather Meal, 50 lb. SKU: Fertrell Feather Meal, 50 lb. 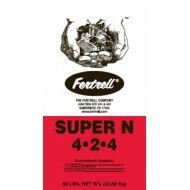 Super N 4-2-4 is specially formulated as a multi-purpose plant food. This organic fertilizer provides readily available nutrients to get the germinati..